Mekong river is one of the biggest rivers of the world. It comes from Tibet and follows through China, Laos, Myanmar, Thailand, Cambodia and Vietnam. This river is very famous for the poetic landscapes and the diversity of animals. Therefore, it has become one of the most attractive destinations in the Indochinese Peninsula. 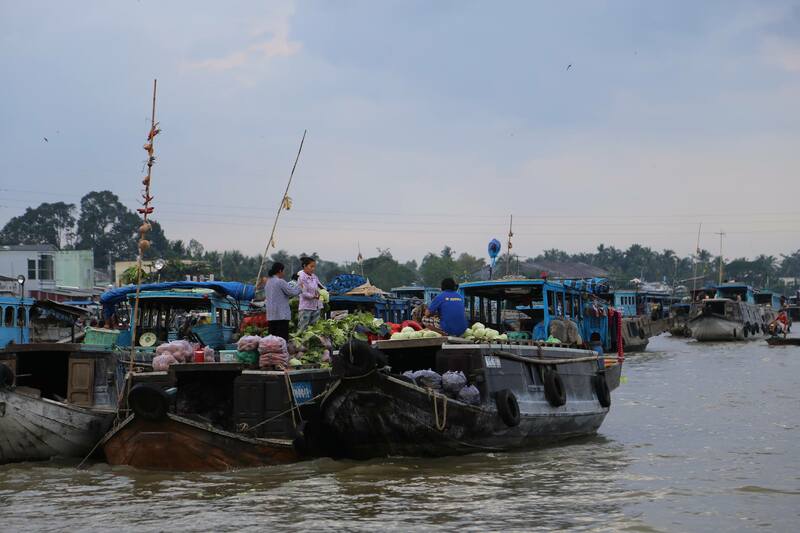 Cai Be floating market is the junction between 3 provinces: Tien Giang, Ben Tre and Vinh Long and is one of the biggest wholesale markets in Southwest region. If you go in group of 10 or more, you should move to Cai Be pier and rent a big boat. The average price for it is about from 500,000 dong to 800,000 dong. If you are in group of 10 or fewer, you can move to Tan Phong pier to rent a dinghy with lower price, about from 150,000 dong to 200,000 dong. On some special occasion, because there are many travelers coming here, you should book the tickets before and ask for the detailed prices in order not to be miss the boat or under the high price. Besides, the package tickets which consist of visiting the floating market, traditional villages, fruit garden and hearing amateur music are usually available. The scenes of Cai Be floating market is beautiful like a wonderful picture of daily activity. The only mean of transport here is the boat. 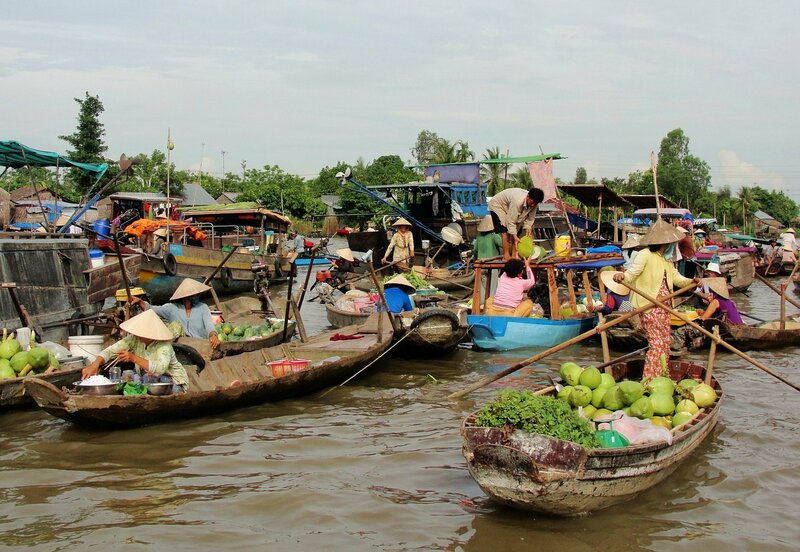 Cai Be floating market has the pure and hick beauty which attracts visitors so much. This market opens all day. There are a great numbers of trading boats and businessmen that come here to sell and buy almost every kinds of good. 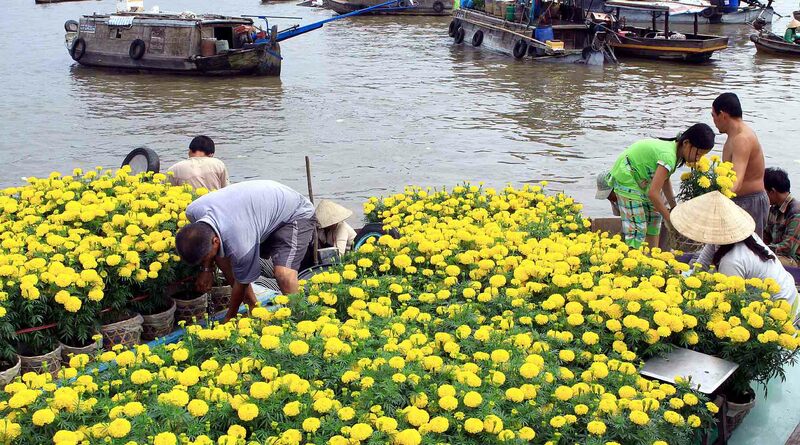 Therefore, the goods in Cai Be floating market are very diverse such as cloth, furniture, poultry, seafood, fruit and flower. Especially, the area for trading fruits is always the most crowded one with many kinds such as rambutan fruit, mango, durian, guava, watermelon and so on. The uniqueness of Cai Be floating market is that people usually hang the symbol of their goods on the high places in their boat for customers to see. This is the reason why the businessmen rarely have to invite travelers to buy. The aurora and the sunset are considered as the most wonderful times to visit Cai Be floating market on Mekong river. If you like the crowded atmosphere, you should visit here in the aurora. This is the time when the market is very bustle. In contrast, if you love the peace and quietness, you should come here in the sunset to see the daily activities of local people – the unique feature of Mekong delta. You will have the romantic and relaxed moments on Mekong river to refresh your mind and throw away any stress. 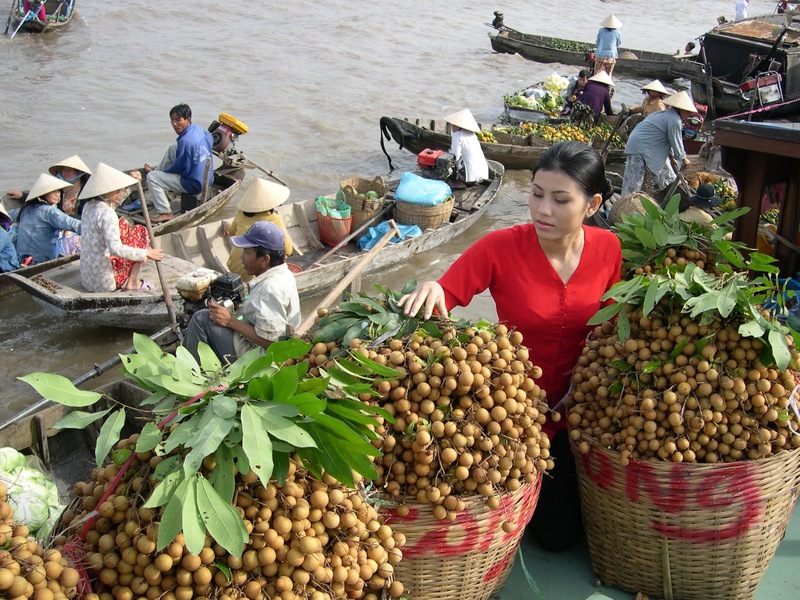 Giving yourselves a chance to explore Cai Be floating market on Mekong river will be a wonderful choice. You can contemplate the beautiful landscapes here and have many interesting experiences.